Just had an email informing me of the end of the open platform TalkTalk tv store, which was Blinkbox before TalkTalk bought it. I believe TalkTalk tv customers will still have access to the closed TalkTalk version of the store. Users of the open platform TalkTalk tv store are being migrated to Rakuten( used to be Wuaki). Despite the reassurances that the service would continue under TalkTalk. I guess they tried it out and found it didn’t work. At one point I thought it would be a dead cert for appearing on YouView. As an aside ultraviolet (if you collect dvds and Blu-rays) has ceased to be supported by Rakuten (and talktalk tv store), which leaves the service very poorly supported in the U.K. Ultraviolet was my primary reason for using Blinkbox. Seems it’s difficult to keep these types of business profitable. I wonder how many people use Rakuten in the U.K.? Sky store ( on YouView), BBC Store, Blinkbox. I guess there can be only one...well maybe two or three. I imagine Amazon is tough competition. I saw this unfold on the TalkTalk community, didn't cause that much of a ripple to be honest, the main issue there seemed to be losing the ability to view previously purchased content on the YouView box. Like you say, it seems to be a forlorn hope trying to compete with the likes of Apple, Amazon, Google etc. But Rakuten are a big Japanese conglomerate and seem determined to give it a go. That’s a fair assessment. I haven’t bought anything digital for a while to be honest. Majority of my digital stuff is now ultraviolet digital versions of bought films, so I’m probably not an ideal customer now. BBC Store seemed like a great idea, I was sorry to see that go. I actually bought quite a bit of stuff on there. UHD is limited on Raukten to only a few new smart TV's (even HD isn't available on any smart phone/tablet). When BBC Store closed, they gave us a fair well token to spend on the Amazon Store. Generally I felt that they were pointing us in Amazons direction for future digital purchases. I had a bad experience with Rakuten, having a very buggy app on my panasoinic tv, still that was a while ago. I’ll have to check to see if things have improved. Checked the Rakuten app on the old Panasonic tv, they appear to have fixed the issue I had with it, which is a good sign, particularly as my smart tv is old by tech standards, and likely not with a big user base. I think the GUI is limited by panasonic constraints. Netflix is similar, and doesn't support the fancy interface we have on Youview. It also had buggy issues for a while, so maybe being a bit unfair on Rakuten. Its an old smart platform after all. However Netflix works fine, and with 5.1 surround on a 2011 smart TV! Isn't about time that Youview/Netflix enabled 5.1 surround on the Netflix app, this is 2018 after all? I imagine Next gen has taken priority, but really can't believe its taking them so long. The insulting thing is they made the effort with the T4000 Netflix app some time ago, couldn't that just be ported? Youview is doing some great stuff with Next gen, but there are some long term issues which have been completely ignored. 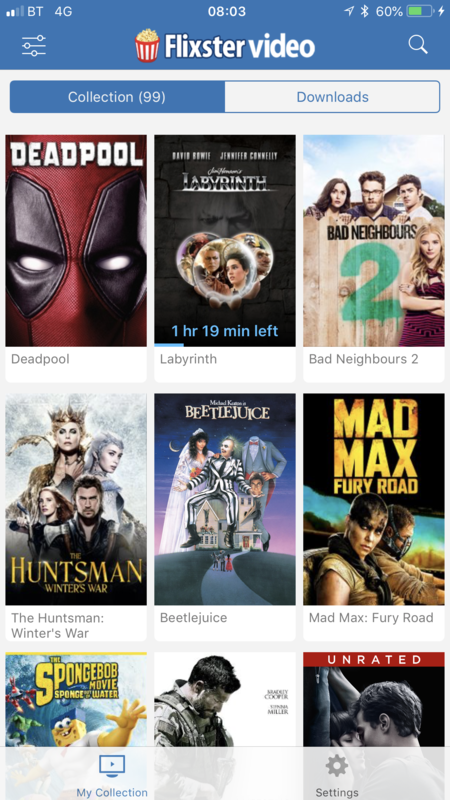 What we need in the UK is our own version of the US Movies Anywhere service which allows you to buy content from Amazon, iTunes, Google Play and others but view it all through one app on a multitude of devices. Yes just come across this. Movies Anywhere looks like a better version of the UV idea. Hopefully it will come to the U.K. with wide support. I know I'm old fashioned but I still prefer hardcopy. Because if the store/supermaket/shop/service I bought it from shuts down I still get to keep it. LOL I was thinking the same thing myself! Followed by the VHS, the DVDs, dearie me, consume-consume!! I hope TalkTalk have considered what happens if any the customers that they are retaining become 'off-net' customers themselves. It also has to be said that basing a transfer of accounts on the same e-mail address being used on each service is at best lazy. My iPad offers me an update to Flixster. But trying to get it, I am told it is no longer available. So I guess Flixster is dead,.. In 2003, I was sent by Sony to look at what these upstart online services were doing in the US, and how this might affect the physical disc services like Blockbuster. @Roy - Flixster works fine on my iPhone (it is called Flixster Video). I let my iPad update to iOS 11.4 yesterday, and the broken Flixster update link went away. And I can now see, and download, the Flixster Video link you mention. I’m still to do the update to iOS 11.4 on both my iPad Mini 4 and iPhone 6s. I stopped using the old Blinkbox service over 18 months ago. I never used it much when I had the service anyway. I had sort of forgotten I was still signed up to the service untill I got an email over a week ago about the end of service.